An annuity is a fixed sum of money paid each period to someone, generally for the rest of their life. It is a form of insurance. The Annuity Schedule will calculate a detail cash flow using regular withdrawals. 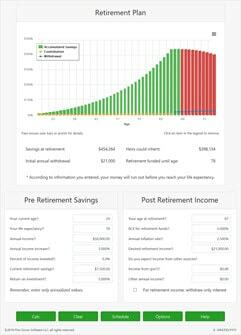 Use this calculator to tell you how long your savings will last. Or you can use it to calculate how much you can withdrawal for some set number of periods.